Please join us for this upcoming Open House June 15, 2017 at 6:00pm. 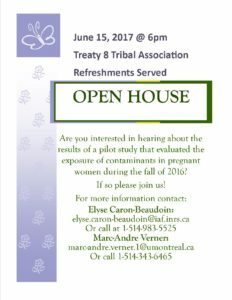 Are you interested in hearing about the results of a pilot study that evaluated the exposure of contaminants in pregnant women during the fall of 2016? In 2016, in partnership with the Treaty 8 Tribal Association, West Moberly and Saulteau First Nations, as well as medical clinics from Dawson Creek and Chetwynd, a pilot study to evaluate exposure to environmental contaminants during pregnancy in the Peace River Valley was conducted by researchers from University of Montreal.